CroMagnon Targets are modular polymer facsimiles of real humans, solid and 3-dimensional. They can absorb thousands of rounds of non-expanding bullets or buckshot. High wear items (i.e. heads) may be replaced separately. Available in green and yellow, they are meant to represent generic human male and female targets for use as either foe, hostage, or bystander. 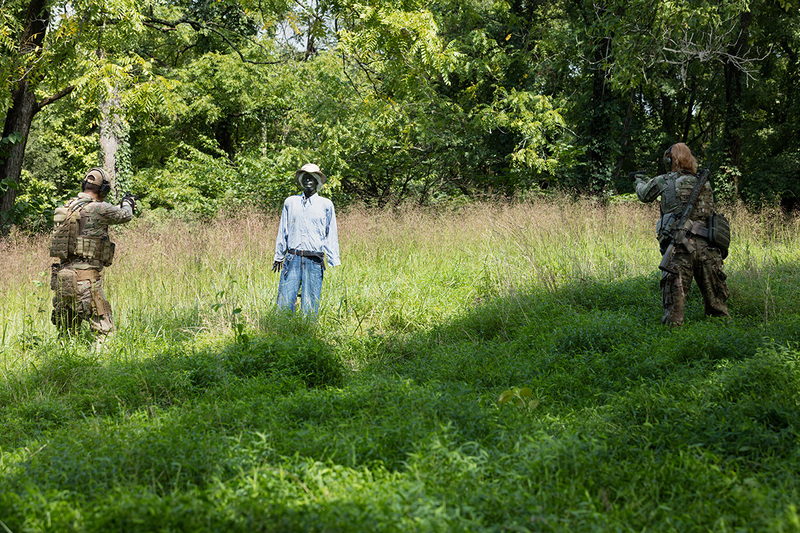 A variety of t-shirts are offered along with them, and of course the targets can be dressed in any old clothes or rags, including camouflage to make them more difficult to spot. The realistic nature of the faces helps condition defenders who may be unused to firing at anything other than stylized paper or featureless steel. 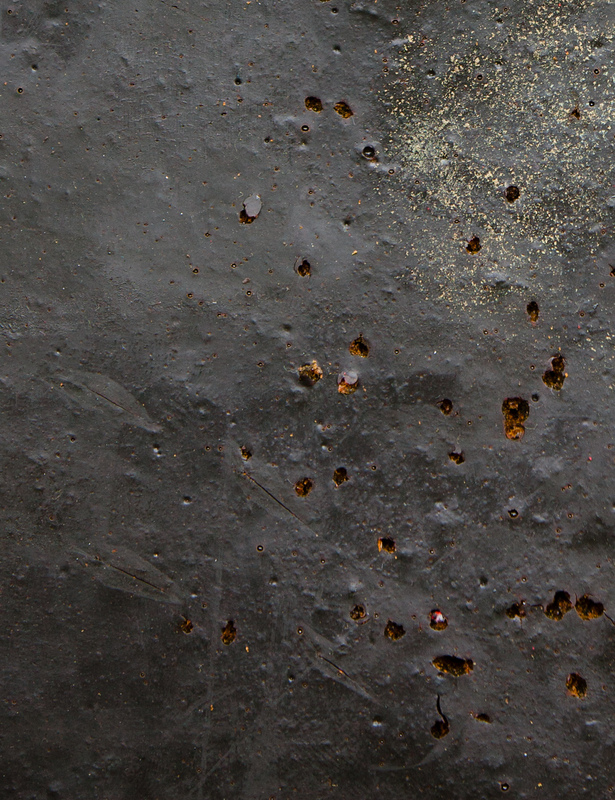 Since the polymer doesn't cause ricochets, firing may be done safely even at contact distance. Currently, the targets are moved around on a two-wheel cart with a trail, but an armored motorized remote controlled base is in the final development stages. Once animated, these targets add considerably to realism. Without it, hits on target are not obvious, the "opponent" might not fall after one or two hits, and it moves unpredictably. Various personas and scenarios are possible, and shoot/no shoot markers in the form of cell phones, guns, knives and other objects may be attached. While they're not inexpensive, these targets are extremely durable and should be long-lasting. Unlike steel, they may be safely shot up close without requiring frangible bullets. Unlike paper, they are three-dimensional and give a better understanding of how targeting of vitals works. We "know" from movies that shotgun blasts knock targets off their feet and make them fly back three to five yards. Physics class memories argue that it's unlikely. Taking a 120-pound 3D polymer target and whacking it with several swarms of buckshot makes liars of Hollywood special effects teams. We tried the same shots with rifles and found even less movement of the target. 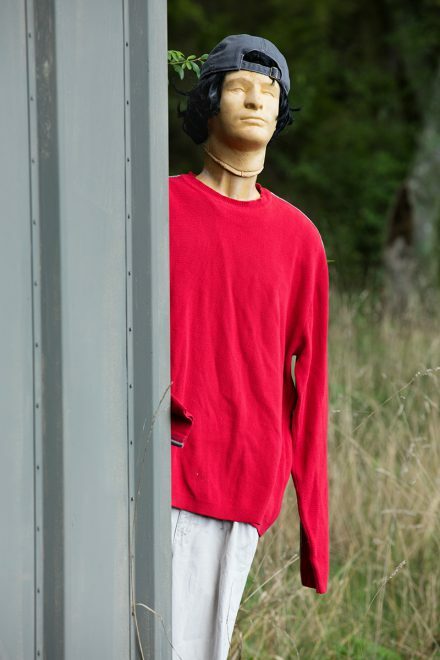 The back of the 3D mannequin looked pockmarked, but it didn't even think of falling over. It appears that the movies may have exaggerated the amount of push imparted by small arms projectiles. 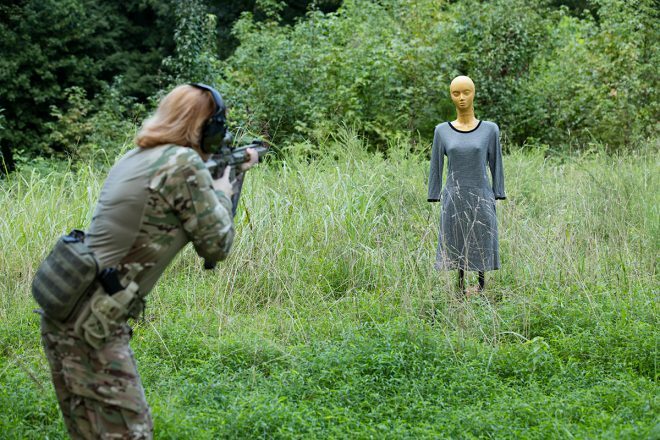 Tactical, Moving, Humanoid, Training Targets, Great for Law Enforcement & Military Live Fire Training Scenarios! We have always promoted the CroMagnon Target as an extremely durable target. We have sent thousands of rounds of various calibers of ammo through our prototypes before we decided to put the targets on the open market. We have a couple of our original prototypes that have better than 10,000 rounds through them individually and they are still going. We studied the results we got from our testing and decided on what recommendations we would make for the best use of our product and how to insure a long and serviceable life to our customers. But as you know we wanted to push it to the limit. Up until recently the largest rounds we had put through it was a 45/70 WinMag with 325 grain soft tip rounds. It made a mark but didn't create any life shortening damage to the target. A while back I had the opportunity to meet Matt Schaefer owner of Tactical Defense Training in Canton OH. Matt has one of our tactical targets and recently put it to the test. After shooting it with the standard 9mm and 45 cal rounds he decided to put the big guns on it. Although we have put thousands of 5.56 and 7.62 through our targets we never did so with fully automatic guns. Matt and his crew unleashed several hundred rounds each of M249, M240, and M2 on the CroMagnon including tracer rounds every tenth round. Although they did some pretty extensive damage with the M2, the 50 cal 720 grain rounds still didn't shoot our target into extinction. Matt stated it withstood the M249 and M240 so good that they even hit it with the M2 and it did surprisingly well. They are still using it. Although I don't recommend using a 50 Cal machine gun on a regular basis I do know that it will take thousands of rounds of standard caliber ammo and last a long long time. I am posting a few of the pics from the range. The picture of the back of the target with the most damage was after three belts of 720 grain 50 cal. All total the target has approximately 5000 rounds in it. And as I stated earlier they are still shooting it. In a increasingly violent world full of uncertainty we as American citizens need to not only protect ourselves, but should understand proper gun safety. It's one thing to own a gun, but it's an entirely different thing to shoot safely and accurately. 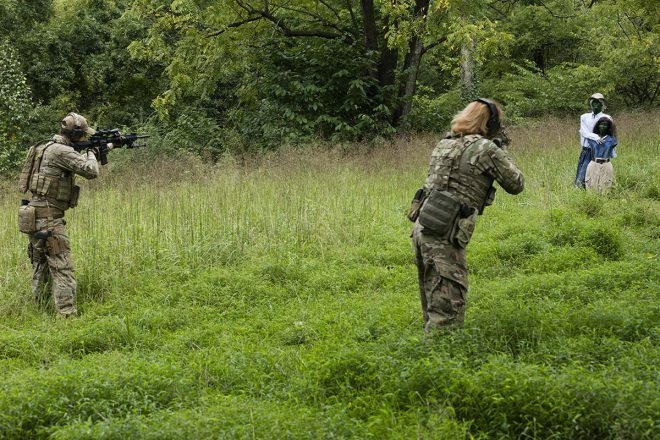 We here at CroMagnon Targets have been driven to give our clients a real world experience where you can create scenarios for your team or squad with a more life-like approach. Our targets are mounted on wheels that allow you to move the target around and place at different ranges for testing proficiency and skill. Orders can be placed directly on our website and will shipped within 5-7 business days. "Bringing Realism to the Range" with CroMagnon Targets - Gunblast.com Watch as Jeff Quinn demonstrates the CroMagnon Targets. "Bringing Realism to the Range" with CroMagnon Targets - Gunblast.com as Jeff Quinn Demonstrates the CroMagnon Target. Jeff Quinn Demonstrates the Effectiveness the Remington RM 380 Semi-Automatic Pocket Pistol on the CroMagnon Target with the Crimsontrace Laser. Shoot Up Your Own T-shirt! The Novaks came to the range to learn some gun safety basics and do some shooting. "I really appreciate the experience we had in learning basic orientation and safety for handguns and rifle. 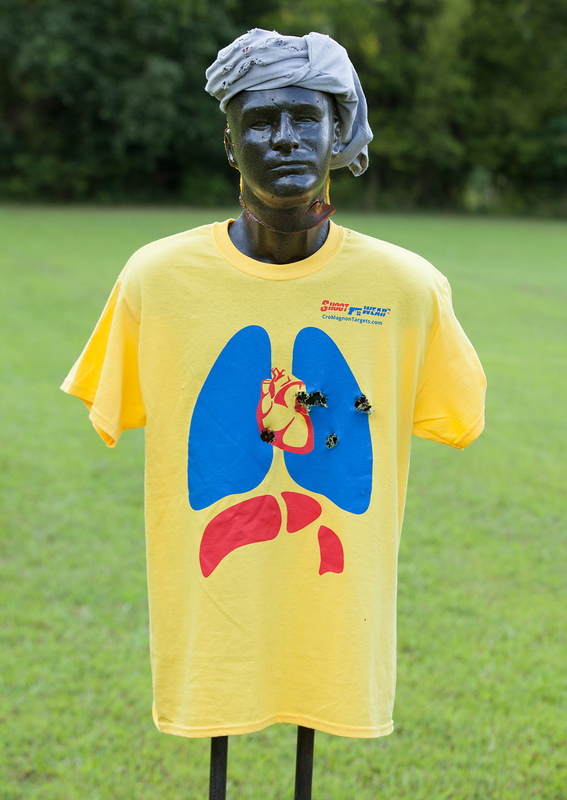 We shot about 150 rounds of 9mm at our target shirts. This is a great way to become familiar with handguns, and a must for anyone considering owning their own. Tim is a great teacher! Thanks again for this unique and meaningful experience! This will help me greatly if I ever decide to buy my own handgun." We've all been there:a trip to the local gun range to practice our marksmanship. We have our ammo and our guns and we are ready to punch some paper.Once we arrive we choose our target.Could it be the usual silhouette that somewhat resembles a man or maybe something more exotic like a wild animal or zombie?Sometimes you may get to choose from a variety of paper targets.But at the end of the day, no matter the target, either it gets thrown in the trash at the range or rolled up, taken home and then thrown in the trash after being shown to a few family members or friends. Shoot n Wear changes all that!Don't throw your trophy in the trash.Wear it proudly.Show off your skills to everyone! Our Shoot n Wear shirts are designed to be shot on the range, then taken home, washed, and worn. Sound crazy?Not really!With several designs to choose from and more on the way, you can show off your shooting skills in a whole new fashion.Be the first to sport your new Shoot n Wear Skull shirt or show that you are a natural born Zombie Killer.Use our target shirts to hone your marksmanship skills. Besides having a cool shirt to wear, think about all the trees you will be saving. Here at CroMagnon Targets, we want your shooting experience not only to be real, but fun as well. 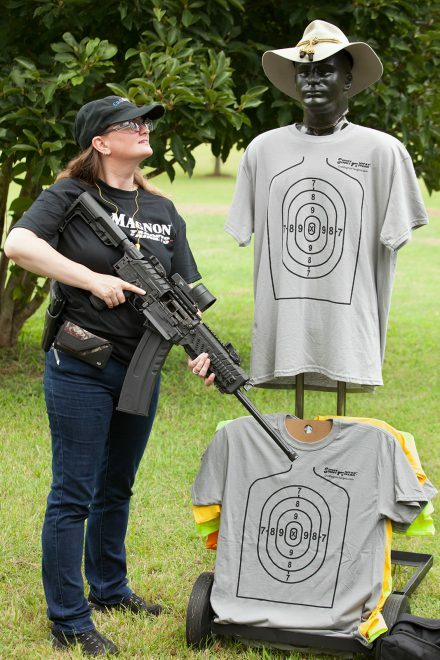 Enjoy our shirts and as always remember to always practice safe gun handling rules, and don't shoot our shirts if they are being worn by a real person.